After two weeks of Brooklyn Nine-Nine uneven approach to its latest major conflict, it’s understandable for one to go into this week’s episode with a question of what could possibly be the Nine-Nine’s eleventh-hour saving grace. While Brooklyn Nine-Nine has gone through with big (albeit temporary) shifts in the status quo like new captains and witness protection, those changes were easier to accept than the very idea of the Nine-Nine being shut down. The lead-up to finding out which precinct will be closed has relied on more of a suspension of disbelief than is usually acceptable when it comes to Brooklyn Nine-Nine, but like with a lot of the series’ arcs, it’s what it does with the finish that truly matters. The cold open is a great start to this week’s episode, and it also subtly works pretty well in planting the seeds for what the story’s conclusion will be. Given the quick introduction of the small-potatoes case of the stolen bike, I immediately assumed the big finish would be the Nine-Nine’s ties to the community currying more favor than the Seven-Four’s (probably very expensive) gang force. So while it’s not quite what happens—and the episode itself chooses to barely focus on the actual hearing—it is that community outcry that eventually helps them out. Not because of a bike case (that ends up being so much more) but because of the inspiration that Captain Holt creates with his love for and loyalty to the folks at the Nine-Nine and the work that they do for the city. That’s exactly what “The Last Ride” is all about, that love and loyalty. That bond. I’ve written before that’s what drives Brooklyn Nine-Nine too, so of course an episode that fully commits to that idea succeeds. The thing about this particular episode—despite the lack of true stakes in this arc as a whole—is that it understands that these characters have every right to believe the end is near for the Nine-Nine. As a result, they end up basically going through their own personal Nine-Nine bucket lists, and that’s a context which finally allows the wackiness to take the wheel without being too much or working against the show’s strengths. For these characters, there’s a 10-hour ticking clock on their time at the Nine-Nine, so of course everything’s a little more intense. Jake/Boyle stumbling onto a BMX heroin trafficking ring, Terry falling short to Hitchcock, and Holt giving Amy a mentoring crash course are all pretty bonkers plots (the first and the last are basically dreams come true), but they’re also a matter of right time and right place in a way that hasn’t quite been the case for the past two episodes. It also helps that the Nine-Nine’s belief this is in fact its last ride allows the episode to be framed like a finale of sorts, even though there’s still so much left to go. For Jake and Boyle, their last ride is a bit of a variation of their plot from earlier this season in “The Night Shift,” only with a more tragic end in sight for the two best friends. Their initial decision to go all out with the case (“happy seat” bean bags, matching leather jackets, fluffing) is a nice way to start things off, but it’s their antics while on the bigger case that truly make the plot; they’re still working with that doomsday state of mind, but the light at the end of the tunnel remains, even through all their eventual binocular tears. Also, for as much as Jake talks about Die Hard and attempts to be the real-life John McClane, he sure does settle into a Keanu Reeves groove pretty quickly when working on his backstory for this case; his Point Break-inspired cover Tyler Omaha has to race a BMX-er named Bodhi (whose dog sadly might face a John Wick-type fate). 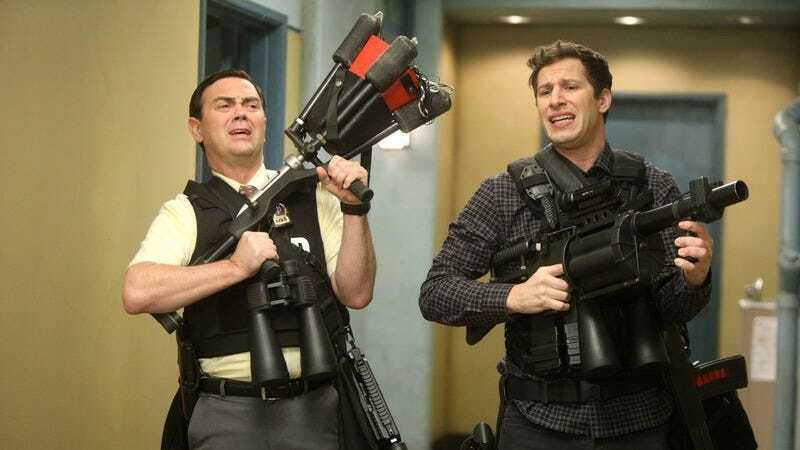 The combination of the case, the humor, and the heart makes for a perfectly solid Brooklyn Nine-Nine plot, as it has all the ingredients an episode needs and never feels like a waste of time, despite the conclusion. Because even though Jake and Boyle solve the case and conduct the bust too late to save the precinct at the last minute, this episode makes it clear why they’re doing it and doesn’t try any plot gymnastics to allow them to have their cake and eat it. There’s no magical solution to their woes, even if Jake and Boyle try their best to make that happen (like with Jake and his BMX “skills”). One could probably argue that the Gina of it all in this episode is still the same as a magical solution to the precinct’s woes, but that sort of ignores what we know about Gina: While she may not be the Beyoncé she claims to be or even the world’s greatest dancer, she still has somewhat of a following and absolutely shows initiative when it comes to getting things done. Of course she would save the day in between cement pranking her colleagues. Having someone other than the usual suspects—though still part of the “inner circle”—stake claim to what should be Terry’s accolade is a simple enough story, but that’s also what makes it work. “The Last Ride” gets back to basics with its simple stories in this episode, focuses on just making them as funny as possible, and it all comes together. For the Nine-Nine, at least. Sorry to the Seven-Four. But the “feel good” plot of the episode revolves around Holt and Amy, with Amy finally getting the acknowledgment of the mentorship she’s always wanted from Holt. A nine-year mentorship plan, to be exact. Only on Brooklyn Nine-Nine could the happy ending to anything be the revelation of an endless supply of tedious (to people who aren’t Holt or Amy) binders. This specifically is what I mean when I say this episode works like a finale without actually being one. While the past two episodes were kind of treading water in order to reach this point, now that the end is here, it does everything to make up for that by fully committing—this time in the form of the Nine-Nine leaving behind a lasting legacy. With the confirmation that there are more binders and plenty more for Holt to teach Amy, it allows that particular plot point to remain tucked away while the audience (and Amy) are left with the knowledge that Holt still has a lot left in the tank when it comes to teachable moments. And Brooklyn Nine-Nine presumably does too, in terms of just moments, moving forward. Though now it will be moving forward with the knowledge that its eventual series finale has to somehow surpass its fake one. This week in webisodes Brooklyn Nine-Nine needs: More classic Gina Linetti pranks, please. “YOU JUST DRANK CEMENT” will be stuck in my head for quite a while. The question is, would Gina pull out other elaborate pranks in these webisodes? Probably not, but the possibility of that happening would be part of the fun. Carl/Mark: “There’s an inner circle?” Finally someone outside our usual Nine-Nine crew spoke on this. It makes a lot of sense for this to happen when the precinct is in peril. Also, of course there’s an inner circle, Carl/Mark. It includes your captain and that group of detectives who turn everything upside down yet somehow remain the only ones who solve crimes. The rest of you might as well be night-shift lemmings. Boyle truly believes the coolest car Jake would find in the impound lot is Herbie from Herbie: Fully Loaded, “without a doubt.” You know what? I can’t fault him for that one. Hitchcock: “You can’t boss me around. I’m the greatest detective in the history of here. Mr. Nine-Nine, out.” The numbers don’t lie, y’all. I wish I had a way to quote how Jake and Boyle’s pleas for Terry to carry their guns sounds. I’m sure one of you commenters will nail it.